Sam and I stopped by the Watershed yesterday to try out a new blend of storytelling and technology. Picking up our PDAs and donning in-ear headphones, we were invited to step back in time and experience a slice of Bristol circa 1885. Over the next 90 minutes we walked around the historic waterfront area (starting at the Watershed, round to the Arnolfini, over the swing bridge, down to the SS Great Britain, back over to the Gasworks, ending up at Canon’s Marsh Amphitheatre) as our stories unfolded. Sam followed the story of the unlucky Maude trying to escape her evil Uncle, whilst I stumbled over a murder to solve with the help of a nearby galley boy. As their respective stories unfolded we dodged some of Bristol’s seedier characters outside the old jail where hangings regularly took place and helped load cargo ships with Guinness, bananas and timber for the colonies. Sam had several mini games throughout her journey and by successfully completing each, Maude’s story progressed. Back in the Watershed we had a chat with Tom Bennett, the guy behind Interactive Places, about the experience and what the future holds. Tom is working out of the Pervasive Media Studio and that pervasive, locative technology was integral to the walk (a GPS PDA worn pendant style with in-ear headphones). By and large, however, the technology was almost invisible, there were only a couple of times that the technology ‘got in the way’. Sam’s lost its GPS fix once and one of her games didn’t want to finish; both times sorted themselves out within minutes and everything else worked fine. In addition to providing a great afternoon stroll, Tom really wanted to know how people got on with the system and what they’d like more of in the next version. Both Sam and I wanted more direct engagement in the storyline with some element of multi-threading, like the “Choose Your Own Adventure” series from the early 80’s to mid-90’s. That is certainly in Tom’s plan but he also pointed out that some people has asked for more history & background to be included, whilst others had asked for more mini-games and side plots. So lots of opportunities! If you want to spend a great hour and a half wandering around Bristol’s Habourside and help out one of our upcoming innovative entrepreneurs, then pop along to the Watershed anytime between 11am and 5pm until Sunday, 26 April and say “Hi” to Tom. 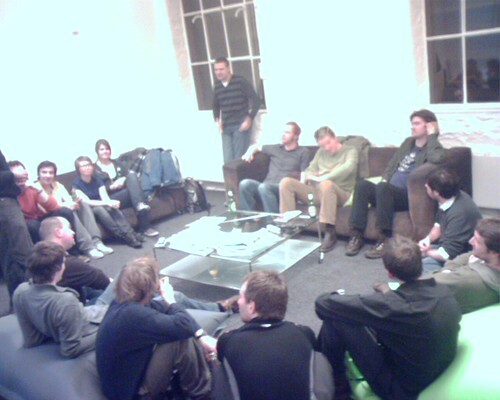 Last night at the Pervasive Media Studio we gathered for the second iGLab. The (by now usual) silliness ensued with various games organised and played in the interests of research. If there was a comment for the next Lab it would be for a bit more reflection between games on strategies, game play, ways of improving. There was a return of scramble (this time played with SMS) with emerging words displayed on a projected board in real(ish) time. A couple of audio games involving dancing to try and find other dancers with the same random tune as you were listening to on headphones, and running around Millenium Square calling out sounds (mine was a police siren) and trying to find your team mates making the same sound. And of course there was a game of Werewolf. The wolves won, easily. This is one of a serious of posts about the Culture, Heritage & Tourism Technology Workshop at the Serious Games Institute on Tues, 4 March. The last session had two moments that really stuck in the mind, the first was Kevin Williams (KWP) talking about kid vending (aimed at 6-9 years olds), basically charge cards for toddlers to play arcade games and use with vending machines for toys, as being a really good idea. On a more positive note was Andrew Caleya Chetty (The Public Gallery that is due to open in June 08). Andrew was benchmarking the new gallery space against Ars Electronica & some UK entertainment venues. It will be a paying attraction and is looking specifically at the family demographic as their “target” & value for money as the differentiator. What was interesting was that each visitor has an RFID tag so that visitors can then receive personalised art exhibits. The first activity in the gallery is ‘choose’. Visitors make curatorial choices that then tailor the other exhibitions. This is a kind of profiling, visitors get to sort colours, textures, etc and these then influence the presentation of the digital and dynamic artworks. A couple of examples that Andrew shared were “Flipme” – make your own stopframe animation and save to personal portfolio. Another was to save secrets and thoughts as ‘flowers’ and collect on way out (not quite sure how this one worked, might have been a paper flower based on your thought/choices. The final installation was an agumented reality flying – dancing – fighting game called Flypad from BlastTheory. This looked a bit like a cross between VirtuaFighter and …, actually it looked like VirtuaFighter but overlaid on a background that was fed from a webcam behind the screen looking across the atrium. So your fighter/dancers were flying around the atrium in VR. When you leave the gallery you can choose to take away a personal exhibition of the art as influenced by your choices and activities. And that was our lot. There was a short jazz gig from SecondLife and a couple of mohijtos that the catering staff whizzed round the room and then disappeared with before anyone could really call it a drinks party. Mind you most of us were at such a level of information overload that I was quite glad of a beer and 3 hrs on the train to work through it all. After lunch Graeme Duncan from Caspian Learning launched into a very comprehensive drill-down into ‘what do we mean by Serious Games’ and when should we use them? Graeme proposed a 3-way Venn diagram of 3D worlds, simulations, games. Caspian locate themselves in 3D worlds but with informed input from games & simulations. This wasn’t meant to be a formulaic or constraining model, but it did help in understanding the contributions from each circle to any one example of a ‘Serious Game. In particular Graeme noted that games speak to our cultural guardians (the young), not in a dumbing down kind of way but perversely in a upping the ante as they were expecting very high fidelity game experience. As a quick demo and example Graeme described a client (major publisher but not allowed to say who yet) that had asked Caspian to look at Rome in Danger (14-16 years). Everything was based on their core proprietary technology, Thinking Worlds. What Caspian did was to build in a graphic fidelity that matches the zone of tolerance for learners. What was far more important were the very detailed briefs with learning reasons for having particular game-like features. On a last technology note, the game runs in Realtime 3D Shockwave in the browser. Dr Esther MacCallum-Stewart (Post-doc researcher, SMARTLab). Esther was specifically looking at MMORPS‘s and stealth learning (a term introduced by Prof Henry Jenkins from MIT). In part of the description of games as learning experiences, Esther noted the huge discussions around Civ II sequence of technology advances (did alphabet lead to code of law?). While these are slightly artificial (its only a game) the arguments, research and competing theses of how civilisation really did advance were evidence of learning. Esther also noted that because they were games, there was a very diverse mix of realism & fakery (or fantasy to be more generous). This is clearly an issue for people trying to use off-the-shelf games for teaching and has been the cause of Sid Myer back tracking in recent years on the historical veracity of his games. Esther also noted that players hate thinking that they are learning. If people are told they’re being taught then its not a game, if its a game then its not learning. However, the online games are now so big that players have to take different roles in order to advance past the most lowly of levels. At this point we moved fairly solidly into WoW. Here there were examples of structured, reflective in guild learning and sharing of knowledge. I asked about authority and reputation in the Q&A and Esther pointed out that there were very strong social & peer forces that managed to an extent, they were also very unstable within Guilds and across worlds. There is a wiki but there didn’t appear to be any emergent structure for learning or teaching or sharing heritage other than a (very traditional) guild based one. Esther also touched on RuneScape as having gameplay around knowledge rather than slash’n’burn. This led to some notes about grinding (or doing small repetitive tasks for an incremental benefit as part of a larger quest or character improvement). The clear message was that players enjoy learning – even if they don’t admit to it. These games often have unexpected outcomes – learning about machinama and YouTube are technically quite advanced and yet many people are learning these skills in order to present their character in a story. A huge amount to take in, and I’m still working through some ideas that have been triggered but definitely a highlight of the day. After coffee Ron Edwards (Ambient Performance) kicked things off talking about mobile & location based goodness. His ambition was to ‘Be where the eyeballs are’. The most recent project was Creative Encounter – in partnership with Black Ridge Games. Ron also talked about a game, Dockers dilemma (a mix of Flashlite and mscapes). Although the game was focused on the mobile device and potentially very individualistic, it turned out that game play was very collaborative. Ron also demo’d a streaming technology from his N95 that looked a bit Qik’ish. Twitter public stream and posted twit’s as small bubbles that slowly floated up in the air and disappeared into the sky. Quite relaxing to watch. I wasn’t on wifi at the time so wasn’t twittering myself (though I did get this sorted after lunch). He then teamed up with Martyn again to show off a 3D audio VR-RL mash-up that moved the sound of his avatar walking around SL around the real-life conference room using the 3D audio software from Martyn and some MIDI sound cues from SL. That wasn’t quite so cool because of lag on the Second Life connection. During lunch we all had ample opportunity to do the networking thing. In addition to the speakers and some University types, I got chatting to Tom Williams (MD Bessacarr Publications) about their work producing conventional guides to heritage sites and their moves into the digital space, to Mike Short (VP R&D, O2) about mobile applications, pervasive media, and the current Technology Strategy Board funding; Clayton Shaw (Arts Council England about all things digital, arty and socially media & mediated, and Geny Calosi (Assistant Editor for AV Publishing about pervasive media, social media, and University/Industry collaboration. There were about 50 folks all told so a very good mix of interests and perspectives. This is one of a serious of posts about the Culture, Heritage & Tourism Technology Workshop at the Serious Games Institute on Tues, 4 March. The event was streamed to the SGI island in SecondLife but I can’t find a link to the slides or any recorded version. The first session was kicked off by Professor Bob Stone from the Human Interface Technologies group at Birmingham University discussing Virtual Heritage, “Then & Now”. After a quick overview of the history of VR and location reproduction, Bob showed a couple of the older projects and touched on their work with Virtual Stonehenge (which suffered from some clumsy marketing/PR from Intel). He then touched on a new human factors guidelines for virtual worlds that is about to be published (its currently being vetted by MoD). This should begin to formalise the experiences of the last +10 years into VR. He also mentioned the Virtual heritage network and VIZIN NIZIA (can’t find a website for this) as resources for folks interested in getting into this field (or learning from it). A few very cool uses of CR that Bob described were Virtual snowshoe mountain, where real meteorological data was being using to show the mountain through the seasons but also demonstrate the effects of climate change over longer time periods. A Virtual great barrier reef where they could model the effect of human intervention and pollution, along with making a CAVE environment for virtual visitors. And a VR dreamscape formed from elements of Lowry’s pictures and reformed into a walk through animation. Current Work included modelling the Scylla to verify artificial life models. Virtual Scylla blends highly accurate sidescan sonar of the Leander Class frigate with models of how seaweed, fish and silt blooms are degrading the ship faster than expected. There is a serious side to this in that a major tourist site is becoming a potential hazard to diving. Bob then showed us a quick revisit of Virtual Stonehenge running on the Quest 3D game engine. This allows Bob and his team to link multi-media objects to in-game items quickly and much greater realism that their earlier Stonehenge project. Mike Gogan, The Virtual Experience Company (now part of Blitz Games) presented 3D Visualisations for Virtual Experience and the interpretation of heritage sites. Having begun some years ago with very (by today’s standards) simple representations of Shakespeare’s birthplace, what Mike was focused on was the story of the heritage site. Mike stressed the need to working subject matter experts for the content but to build in interpretation experts to connect with the audience (and to work out who the audience is). Anyway, back to Mike who was now giving us a flythrough of the Houses of Parliament around 1440. Someone asked about using advertising in-games / media funding to pay for experiences. This wasn’t something that Mike was working on but it might be something to be developed, Blitz have made adver-games for other platforms / purposes. Last up (before coffee) was Martyn Ware (Future of Sound, Illustrious Company, founding member of The Human League and Heaven 17) with some staggeringly cool examples of 3D soundscape projects from around the world. The focus was on building immersive 3D soundscapes, emotionally engaging experiences through audio. His ambition was to build a “better than Star-trek holo-deck”. Part of the demo was a slightly disconcerting, but very impressive flight of a bird around the room (on the tech front Martyn can control up to 16 sounds, sync’d with 25fps for video meshing). He was also experimenting with using 3D soundscapes to transport experiences to other locations (Mexico City in Long Beach California). They were also playing with city-scaping (LondonScape) – audio abstraction of a city rather than a representation of that city. The headline project that was on teh title of the presentation was Rome Reborn 1.0 – set in 400ad, Martyn was planning a full 3D sound experience to match the VR experience to convince you you’re in ancient rome. One setting that is in discussion was to repopulate the coliseum with 50k Romans cheering their gladiator. Another (smaller but no less interesting) project was a sensory theatre at Threeways School in Bath due to opening later in 2008. I’d really like to get Martyn involved in some research or demonstration projects at the Pervasive Media Studio in Bristol. And then there was coffee! !